Neurorehabilitation devices have immense utility across the medical fraternity which has led to the rise of a number of players within the market. 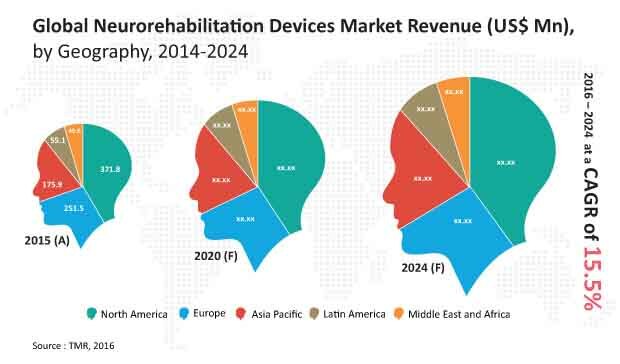 Hence, the global neurorehabilitation device market manifests a highly competitive vendor landscape. The top three players in the market held more than 50% of the total market share, reflecting the difficulties associated with the entry of new players into the market. These leading players are Medtronic, St. Jude Medical, and Hocoma; all of these players are expected to keep innovating their offerings in order to retain their dominance. The technological advancements coupled with the breakthroughs made in the domain of brain research have given an impetus to the development of neurorehabilitation facilities. The market players are on their toes to utilize the opportunities that lie within the market and gain a higher market share by offering better products. The leading market players have embraced key technologies such as Internet of Things (IoT), nanotechnology, and robotics in order to enhance their product portfolio. The lucrativeness of the market has prompted these players to stay abreast of the latest developments and harness them with immediate effect. St. Jude Medical introduced Proclaim ELITE which is the first of its kind system meant for relieving pain through a spinal cord stimulation system. Transparency Market Research prognosticates that the market for neurorehabilitation devices would expand at a stellar CAGR of 15.50% over the period from 2016 to 2024. The market value is expected to rise from US$894.9 mn in 2015 to a robust figure of US$3.2 bn by 2024. Based on application, these devices find extensive use for curing and relieving the ailment caused Parkinson’s disease. Geographically, North America and Europe are anticipated to outdo all other regional markets. The prominence of the healthcare infrastructure along with the proficiency of medical personnel are expected to drive these regional market. The growth of neurological disorders has escalated demand within the market. Parkinson’s disease has especially been a major matter of concern within the medical circles. This has risen the demand for neurorehabilitation devices because several healthcare units and practitioners now find these devices indispensable. Furthermore, the rising toll of patients who are diagnosed with neurological disorders such as traumatic brain injury, strokes, cerebral palsy, and spinal cord injury has been plaguing the healthcare industry. Governments across the globe have assisted in the purchase and installation of neurorehabilitation devices, thus, enhancing the prospects of market growth. Patients who have been suffering for prolonged periods have seen some hope in the form of advancements in technology. The nascent devices for neurorehabilitation are being welcomed by the healthcare industry in order to alleviate the burden of treatments. A peculiar factor driving demand within the market is the rise in the number of road accidents, especially in the Asia Pacific region. Despite the rapid growth of the market, a number of factors still inhibit the smooth flow of the market. The lack of skilled surgeons and medical practitioners in developing countries has been a major downfall for the global market. Furthermore, the emerging economies are not in a position to make fundamental changes to their medical framework. Since neurorehabilitation devices incur high costs of implementation, the market is restrained in the financially weak regions. The lack of awareness in a number of regions also places a negative scar on the market. Nevertheless, the need to effectively treat neurological disorders will keep bolstering the stakes of the market. The growth of neurological disorders has escalated demand within the market. The lack of skilled surgeons and medical practitioners in developing countries has been a major downfall for the global market.